I have lots to be thankful for. Friends. Family. Beer. Pumpkin-flavored EVERYTHING. A little lovin' from the oven. There’s one thing I don’t understand. Why can we only have pumpkin-flavored things in late fall? Sure seasonal availability might play a factor in society’s decision to ration the pumpkin goods, but most people make their pies, muffins, and cupcakes from the canned pureé anyway. From now on, I’m going to make pumpkin flavored baked goods whenever I like. Try and stop me. 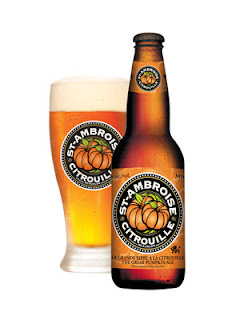 Personally, I prefer winter-spiced seasonal beers to the pumpkin varieties. However, there is a certain appeal to a pint of spicy, squash-y goodness with the turkey dinner grand finale. I am especially fond of St. Ambroise Citrouille from the McAuslan Brewery. The squash flavor definitely takes a back seat to the cinnamon and nutmeg character, but adds a detectable caramel sweetness to the brew. This year Alley Kat also released a Pumpkin Pie spiced beer, but I have yet to locate a bottle. I’ve heard several good reviews from fellow beer geeks, and I would be severely disappointed if I were to miss it. 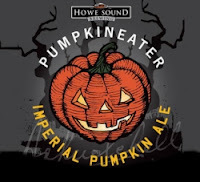 The Howe Sound Brewing Company makes Pumpkin Eater, a strong ale flavored with this significant squash. It also makes an excellent cheesecake, I might add. I began my Thanksgiving weekend with a field trip to Prairie Gardens , a pumpkin patch and "adventure farm" in Bon Accord, AB. There's a haunted house, a corn toss, a petting zoo...it's great fun. My partner-in-crime asked if I knew how to cook with fresh pumpkin. I had never done so, but was unable to resist a new challenge. We selected two pumpkins to bring home from our excursion: a large green specimen to carve into a monstrous “Pumpkinstein”, and a smaller one to roast. Easy as pie. Pumpkin pie. Step 1: Choose a pumpkin that is about the size of a cantaloupe. Step 2: Remove the stem by wedging a knife underneath and using it as a lever. A machete works well, but a butter knife will suffice. Step 3: Cut your pumpkin in half lengthwise, through the hole left by the stem. If you’re a lazy frail and helpless woman like me, get a big strong man to complete this step. Step 4: Scoop out the pulp and seeds. Sprinkle the seeds in salt and roast them to sustain you through the arduous cheesecake-making ordeal. Step 5: Place pumpkin halves face down on a baking sheet lined with aluminum foil. Step 6: Roast at 375°F for 1-1/2 hours until the skin easily pulls away from the flesh. My only warning is this: once you have tasted freshly roasted pumpkin, you will never go back to the canned pureé. It will taste insipid and stale in comparison. We used the fresh squash puree to create a scrumptious cheesecake with Howe Sound Pumpkin Eater strong ale. This recipe is adapted from my favorite beer blog, The Beeroness. Very often she posts recipes that I too thought beer would improve, while other times she conceives combinations that even I had never dared to devise. In a food processor pulse ginger snap cookies, processing until they are fine crumbs. While the food processor is still running, add the melted butter and process until it resembles wet sand. Press buttered cookie crumbs into the bottom of a 9 inch spring form pan, or into several miniature foil pans. In a large bowl, combine brown sugar and cream cheese. Cream with an electric mixer until well combined. One at a time, add the eggs and vanilla, mixing until well combined. Scrape the bottom of the bowl with a rubber spatula before adding each egg. Add the pumpkin puree, cinnamon nutmeg and salt. Mix until well blended. Sprinkle the flour over the bowl, stir on medium speed until an even consistency is reached. Pour cream cheese mixture over the crust. Bake at 350 for about one hour or until the centre is firm. Chill until set, about 3 hours. Or 1 hour, if you’re impatient like me. Garnish with maple syrup and top with toasted pecans before serving.